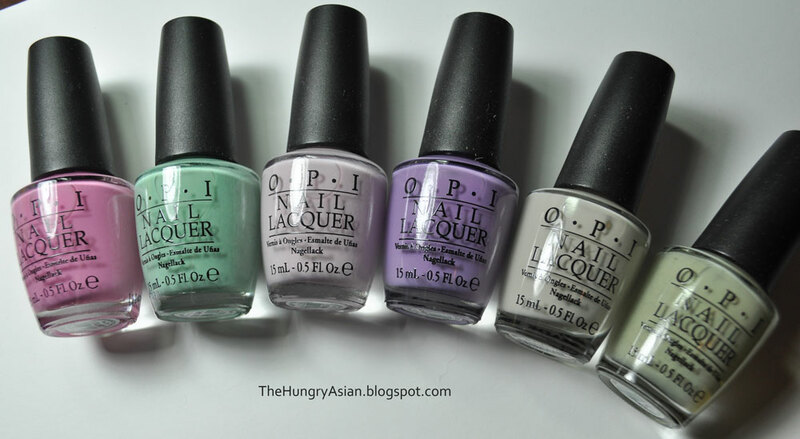 This year's Spring BRIGHTS Collection by OPI offers 6 new creme shades and a silver shatter. These colors are themed with the latest Pirates of the Caribbean movie, On Stranger Tides. Also in the collection is Silver Shatter, which I forgot to include in the above photo. Skull & Glossbones 3 coats. Light beigey grey, I have already worn this twice as a full manicure. It looked a bit blah in the bottle but after wearing it I just love it. Sparrow Me The Drama 3 coats. Cool dusty pink. I don't think these kinds of pinks look good on me unfortunately. Steady As She Rose 2 coats. Very pale pinkish lavender. I was surprised this covered in 2 coats! I love how soft and dainty this makes your hands look. Planks A Lot 2 coats. Slightly darker in person, this is a nice light purple. Love the name too! Mermaid's Tears 3 coats. Muted jade green. Stranger Tides 3 coats. This is a very pale murky olive green. Silver Shatter comes with this collection, I think it's a pretty neat shatter color. Here it is over black. Here it is over Skull & Glossbones, Stranger Tides and Steady As She Rose. These light pastels are harder to see under the sparkly silver shatter. Over Sparrow Me The Drama. Finally here it is worn alone, which I liked a lot. 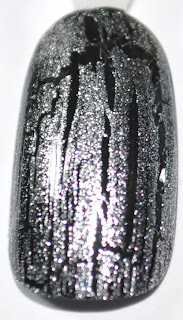 The Silver Shatter is pretty awesome, I can totally see myself trying it over many manicures this summer. The formula for this collection was superb. At first I thought it was on the watery side, but as I continued to swatch I found that it's just right for these light cremes. It made application quite easy. This is a pretty neat collection, I do like the dustiness of the colors it gave it an interesting twist. My favorite shades were Skull & Glossbones, Steady As She Rose and Mermaid's Tears. These are available for purchase now.